Do you love coffee and latte art? Do you want to work for a company where you can learn and grow in a fun environment? 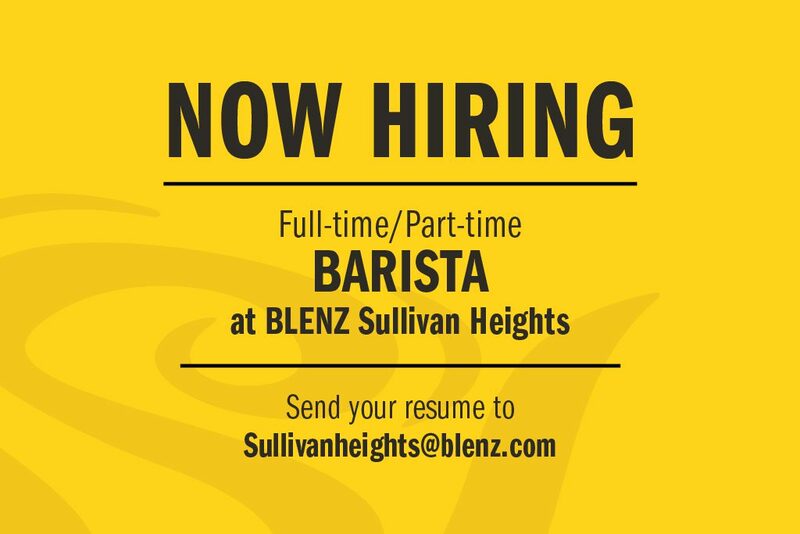 Sullivan Heights Blenz Coffee is hiring for a full-time and part-time barista for all shifts! We are looking for an outgoing, passionate, hard-working individual to join our Blenz team! We provide all training, but experience is an asset. If you think you are a perfect fit please email Sullivanheights@blenz.com or Shalin@blenz.com Please note to put your availability on your resume. My name is Anu Sharma and I am a senior at Sullivan Heights Secondary School! I love to interact with others and learn new skills in the workplace, while eagerly seeking new responsibilities. I also accept challenges with a positive and open mindset, ready to utilize the skills I have gained in the past. I believe that by working as a Barista with Blenz Coffee, I will be able to learn fun and interesting skills along with providing others with great service! Thanks for getting in touch with us. To apply please email Sullivanheights@blenz.com OR Shalin@blenz.com to apply with your resume attached, as well please let us know your availability. Hello my name is Meghan. May I apply for this job despite my age of being sixteen?